Great Speckled Bird performing (probably doing C.C. Rider) in Calgary, July, 1970 on the legendary Festival Express tour with special guests. Left to right: Buddy Cage, Jerry Garcia, Ian Tyson, Sylvia Tyson, Jim Colegrove, Delaney Bramlett. 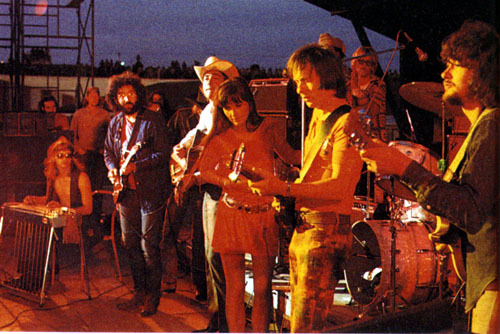 Between Jerry and Ian, you can see Bob Weir who is wearing a hat and leaning to his left. Directly behind Colegrove's head is Grateful Dead drummer Bill Kreutzman. The girl is Bonnie Bramlett. Out of the photo N.D. Smart is on drums and Amos Garrett is just to the side of Delaney. Later, Bonnie Bramlett came up and sang with the group on a rousing rendition of Will The Circle Be Unbroken. This was the last night of the tour. When the concert was over the group returned to the hotel in two autos. The car that Ian and Sylvia were in also had N.D. Smart and Buddy Cage. On the way back to the hotel they came in contact with a carload of antagonists that followed them all the way to the front door of the hotel. There, a street fight ensued in which Ian broke a bone in his left hand. Since their TV show began production the following week, Ian was unable to play guitar on the show. After 33 years passed the documentary film of the Festival Express and was first screened September 9 and 13, 2003 at The Toronto International Film Festival. It was released in the U.S. July, 2004. 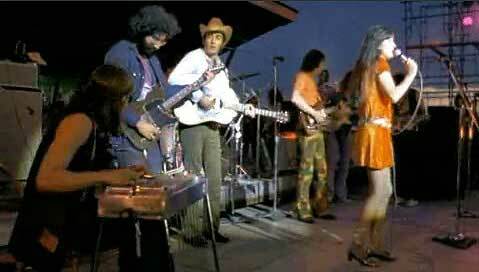 This film was shot during the traveling event known as Festival Express in July 1970. It featured some of the most well-known rock stars of the time. The tour was a three-city run across Canada that offered a communal mode of travel for all that were involved—the train. Those musicians and cohorts who chose to travel on the train for five days also lived and rehearsed in it. They also did a lot of partying. But it was more than that. To those involved it turned out to be a final gathering of the tribes. The critical response to the film has been positive. It has now taken its place as the last of the great 1960s' rock festivals. Get the DVD. It's now available. Great Speckled Bird (with special guests), Festival Express, Calgary, July, 1970, L-R: Buddy Cage, steel; Jerry Garcia, guitar; Ian Tyson, guitar; Jim Colegrove, bass; Delaney Bramlett, guitar; Sylvia Tyson, vocal; Amos Garrett, guitar. ©2008, The Cool Groove, All Rights Reserved.